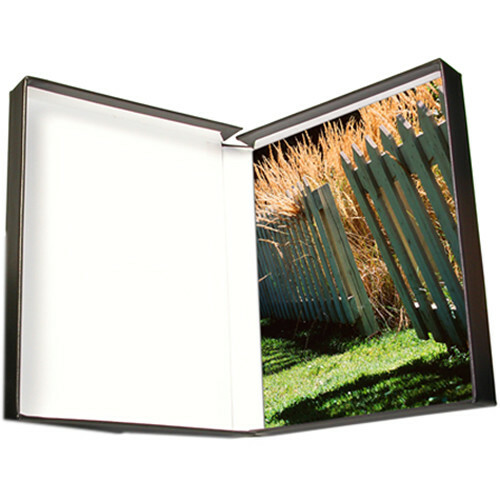 Safely store your printed pictures or images inside this 22 x 28" Clamshell Box from Print File, seen here in a stylish black buckram exterior and white interior. This box features a depth of 1.3" and is capable of holding approximately 19 2/2 ply prints. The clamshell design of this box makes it easy to regularly access your contents, allowing you to simply lay it flat on the table and swing open the lid. An acid-free and lignin-free interior lining makes this case suitable for long-term use, and helps it preserve prints in their original construction. Each box is made of 0.098 heavyweight binder's board with a neutral pH adhesive and buffered construction. Box Dimensions (LxWxH) 29.0 x 23.0 x 3.0"